The Book Club Novel Guide outlines a complete theme-based unit with Book Club lesson plans focusing on The Cay. Below you will find a synopsis, further reading materials, discussion topics, and reviews that you might find useful during your teaching of The Cay. During World War II, Phillip Enright and his parents, Americans from Virginia, relocate to Curaçao, where Phillip’s father helps in the war effort. When German submarines attack ships in nearby waters, Phillip’s mother decides to take him back to Virginia until the war is over. Two days into the voyage, their ship is struck by a torpedo. Phillip is injured and falls into the sea. When he awakens, he is on a raft with an old West Indian ship worker named Timothy and a cat. Phillip, whose mother taught him that black people are “different,” feels uncomfortable around Timothy, although Timothy is friendly and caring toward him. When Phillip’s head injury causes him to lose his vision, he must rely on Timothy. The two soon land on a deserted island. There Timothy sets up a camp, locates food, and keeps a fire going in the hope of rescue. He also trains Phillip in basic survival skills. At first Phillip resists, but gradually he becomes more independent and grows to trust and admire Timothy. Several months have passed when their survival skills are tested by a hurricane. When it is all over, Timothy dies. As Phillip buries his companion, he feels both sad and grateful for all Timothy has taught him. He is able to survive on his own for about two months, when he is finally rescued. Phillip is reunited with his parents. He undergoes surgery to have his sight mostly restored. As life returns to normal, he finds himself drawn to the company of the black people on Curaçao. In the final pages, an older Phillip speaks of revisiting the lonely island where his friend Timothy is buried. The following sites can be used to support and enrich the Book Club unit for The Cay by Theodore Taylor. Theodore Taylor — A brief biography of Theodore Taylor is presented here at the author's website. Theodore Taylor — Exodus Books website has compiled a short biography and a list of his books. Curaçao — A brief history of the Netherlands Antilles is accompanied by photos. 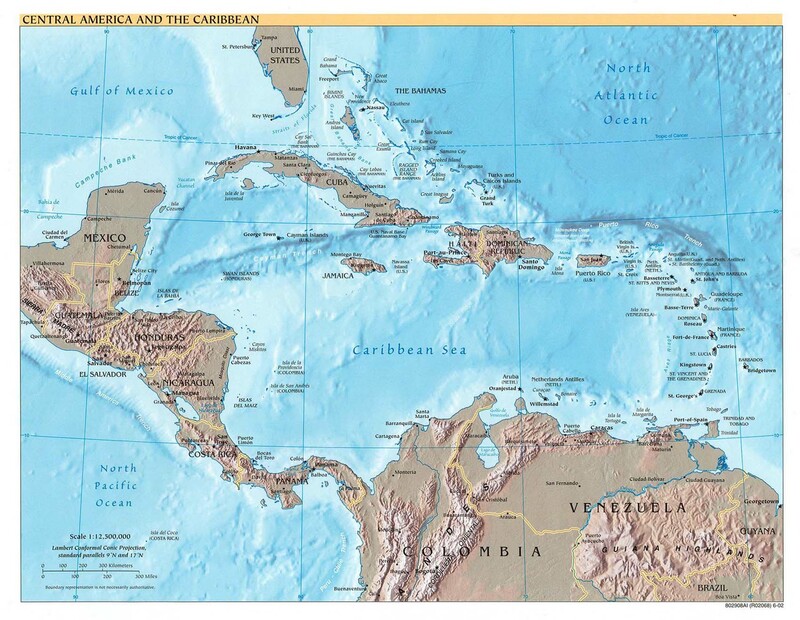 Map of the Caribbean — A detailed and colorful map of the entire Caribbean area is found on this site. Reef Ecosystem — From Sea World/Busch Gardens comes this informative look at the formation of coral reefs, the inhabitants of the reefs, and the threats to the existence of coral. Growing Coral Experiment — This site provides instructions for an experiment that will help students understand the way that coral reefs are formed. Simple household materials are required. Photographs of Fish and Invertebrates of the Caribbean — Stunning photographs of a variety of the inhabitants of the Caribbean Sea, including the moray eel, can be enjoyed in this gallery. Flying Fish — The image of a flying fish and a brief description of its "flying" abilities are given on this site. Spiny Lobster — A photograph of the spiny, clawless lobster or langostais displayed. World War II — A website by BBC geared towards kids to learn about the history and live during the war. Curaçao Culture — This site holds a wealth of nicely presented details about many aspects of the life and people on the island. Facts about food, birds, plants, animals, and geography are given as well as information about the ethnic composition of the population, and the customs and folklore associated with the culture. On Voodoo — This well-written and informative essay recounts the author's personal experiences with a voodoo ceremony and explodes some of the myths associated with the practices. U-Boats in the Caribbean — A map that locates the positions of the German submarines in the Caribbean is accompanied by an explanation of their role in World War II in trying to damage oil and aluminum supply lines of the Allies. U-Boats — Anything and everything visitors could possibly want to know about the German submarines in World War II can be found on this site. Hurricanes — Much information about hurricanes is presented in a colorful and simple format. How does a person learn to become self-reliant in a new and challenging environment? What are the most important components of friendship? What are some positive and negative aspects of depending on someone else to survive? How does a person overcome prejudice? How can personal experience help people to overcome their prejudices? The following section can be used to get discussions started in your classroom. It is based on the Lesson Plan within the Book Club Novel Guide for The Cay. The Lesson Plan includes blackline masters for the students that support the writing prompts. The writing prompts provided are meant as suggestions only. As students become more comfortable with the Book Club format, they will certainly have ideas and questions that go beyond the prompts. Consider giving students “free choice” as a log option. Book Club Reading Logs help students respond to literature and organize ideas as they participate in Book Club. How would this story be different if it were told from Phillip’s father’s point of view? His mother’s? Henrik’s? How would it be different from the third-person point of view? Rewrite a paragraph of the story from one of these points of view. Begin a character map for Phillip. What is one dominant aspect of the setting? Describe this aspect using details from the book. How does Phillip feel about the war now? How have his feelings about it changed? Would you feel the same way in his situation? Construct a prediction chart of your own. Make at least three predictions based on the foreshadowing in Chapter 2. Identify a few of Timothy’s phrases that you particularly like. Paraphrase them in Standard English. Tell why you like them. Begin a character map for Timothy. Make inferences about his personality traits based on his actions. Record in a sequence chart what happens to Phillip after he leaves Curaçao. How does Phillip respond to Timothy? Why? Continue recording and adjusting predictions in your chart. How does Taylor use foreshadowing early in Chapter 4 to hint at Phillip’s future blindness? Is the foreshadowing effective, or is it too obvious? Analyze the relationship that is developing between Timothy and Phillip. Use evidence from the book to support your ideas. What kinds of conflict do you find in this story? Record examples in your log. How do you predict each conflict will be resolved? Using the information Timothy gives, plot the approximate latitude and longitude of the cay. Identify Timothy’s favorite words and phrases, and explain what you think he means by them. Use the vivid descriptions in Chapter 7 to draw a picture of the island. Continue examining the two characters and the development of their relationship. Adjust previous predictions and predict what might happen to Phillip and Timothy on the island. How is the relationship between Timothy and Phillip changing? How can you tell? How does Phillip react to Timothy? Do you think the conclusions Phillip draws about Timothy’s behavior are fair? Explain. How does having a first-person narrator affect the characterization presented in the story? Continue adding to your character maps of Phillip and Timothy. Write a paragraph using five or more new words from the reading. Be sure to include context clues in your writing. What is Timothy doing on the north beach? Why? What major development occurs in Phillip and Timothy’s relationship? At the end of this chapter, the author foreshadows upcoming events. Record these clues in a prediction chart and make a prediction. Compose a one- or two-page letter from Phillip’s point of view to his parents about his current situation. Record any new information about hurricanes that you learned from reading Chapters 14 and 15. Identify several similes Taylor uses in Chapter 15 to describe the hurricane. Tell why these are powerful descriptions. Draw a picture to represent the two characters’ experience of being in a hurricane. Refer to the vivid descriptions in Chapter 15. How does Phillip react to the loss of Timothy? How does his loss make you feel? Summarize Phillip’s activities now that he is alone on the island with only Stew Cat for company. What themes does The Cay share with the read-aloud novel? Write a two-paragraph description. You may choose any topic for your description, but you must use sensory details that appeal to at least four of the five senses. What senses does Phillip rely on most as he lives alone on the island? Give some examples. At the end of this chapter, Phillip has some intense emotions. What are they? What is the reason for these emotions? How do you think the story will end? What makes you think this? Identify a theme that you see in The Cay. Support your choice with evidence from the story. Describe your emotions as you read the ending of the book. Why is it significant that Phillip regains his sight? What new understanding does he have? What conflicts are resolved in Chapter 19? What do you think of way the book ended?